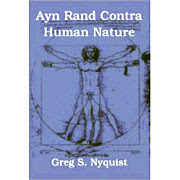 Ayn Rand Contra Human Nature: Did Rand read Kant? Given how difficult Kant is to read and interpret, perhaps we can cut Rand some slack on this issue. Shoshana Milgram, however, does not believe Rand requires any slack cutting. While she admits that there is no evidence that Rand read Kant, she contends quite laboriously that Rand had too much intellectual integrity not to have read Kant. What about those of us who are inclined to suspect that Rand did not read Kant (or read very little of him)? To such skeptics, Milgram has this to say: "To go as far as to say [Rand] didn't read any of these guys [like Kant] ... you don't have the evidence for that. And you need evidence for it." This is an example of what Rand apologists frequently will do when faced with criticism of Rand. They attempt to hold Rand's critics to a higher standard than they are willing to follow themselves. For the fact is, Milgram does not provide any evidence that Rand read Kant. Why does she demand from Rand's critics what she herself is unwilling (or unable) to provide? The ostensible reason why Rand referred to Kant as “the most evil man in mankind’s history” is she believed that, more than any other philosopher, Kant “closed the door of philosophy to reason.” Why Rand believed this is a bit more complicated. It’s important to note that Rand’s views on Kant are, to say the least, controversial, and no Kantian or Kant scholar would agree with them. The idea that Kant’s philosophy, particularly The Critique of Pure Reason, constituted an attack on human knowledge and reason was first popularized in America by George Santayana in his book Reason in Common Sense. “Side by side with this reinstatement of reason, however, which was not absent from Kant's system in its critical phase and in its application to science, there lurked in his substitution of faith for knowledge another and sinister intention,” wrote Santayana. “He wished to blast as insignificant, because ‘subjective,’ the whole structure of human intelligence, with all the lessons of experience and all the triumphs of human skill, and to attach absolute validity instead to certain echoes of his rigoristic religious education.” In the first few decades of the twentieth century, Santayana’s view of Kant and other German philosophers enjoyed some measure of influence among conservative intellectuals in America. This is where Rand seems to have picked it up. Perhaps the most important influence in Rand’s philosophical and political development was the conservative novelist and literary critic Isabel Paterson. According to one of Rand’s biographers, Jennifer Burns (who learned this piece information from the Rand archives), it was from Paterson that Rand probably derived her view of Kant. With all this in mind, we can advance a more plausible conjecture of the real (as opposed to ostensible) reason for Rand’s colossal disdain for Kant. She needed a scapegoat, someone to blame for why people immediate accept her philosophy Objectivism philosophy of “reason,” egoism, and laissez-faire capitalism. Since she had already come to believe, for reasons which neither she nor her acolytes have adequately elucidated, that philosophical ideas determine the course of history, it was only natural that she would need a philosophy—or a philosopher—to blame for the events and trends in the course of history which she detested. With Paterson as the initial inspiration, she chose Kant. 1. 100 Voices. There is reason to suspect the editing. I spoke to a couple people who said what they signed off on was less text than what was printed in the book. 2. Rand's anger. We have been told that this was Rand's one humanizing flaw, and Milgram agrees that Rand' anger could be a little over the tip. Yet she emphasizes that it was often anger at people who betrayed their "word" to Rand. Are we going to get some score settling once this book comes out? Yes, the interview is rather defensive. Milgram spends a great deal of the interview trying to justify why it's taking her so long to finish the biography. She's insisting on how she's being extra zealous about sources, and not accepting anything that isn't multiple sourced; and in this we can detect a kind of strategy to deal with the problematic aspects of Rand's life. She'll simply claim that most of the negative stuff doesn't have multiple sources and therefore this will give her license to ignore it. But she can't ignore claims about Rand's anger, because even Peikoff has admitted that Rand could get angry and that it wasn't always 100% fair when she did so. So we find Milgram engaged in damage control. She insists Rand's anger was based on "justice," but this, far from excusing Rand, only makes Rand's temper tantrums even more disturbing. The problem is, if "justice" necessitated everyone to be angry like Rand, society would break apart and we'd be at each other's throats like lions and tigers. Hardly anyone would want to live in that kind of social order. A while ago I asked the archives if the oral history project interviewed the Blumenthals and the Holzers. I was told no. I wonder if Milgram has sought to use the interviews that Barbara Branden, Jennifer Burns and Anne Heller too. Gordon suggested that the bio will come out when Peikoff dies. I don't know what her arrangement is with the archives. I think Burns said Peikoff had to sign off on allowing her to use materials from the archives. I'd doubt that Milgram is waiting for Peikoff to die. I doubt that Peikoff is of any relevance any more. Like King Lear, he's too old to be a threat to anyone. Yaron Brook is in charge now of the ARI-centered brand of Objectivism, and he's trying to move Objectivism forward and make it more relevant to the real world. That means getting beyond the old feuds of the past and trying to engage with the broader the world. It's the reason why Brook is almost desperate to be considered part of the Intellectual Dark Web, and is under the (false) assumption that if only he could have long-form conversations with Sam Harris, Ben Shapiro, Joe Rogan et al that that's going to somehow help spread Objectivist ideas. Now I can't imagine earlier Objectivists like Peikoff, Schwartz, Binswanger, let alone Rand herself, wanting to be part of the IDW. At the bottom of it all I suspect Brook is just a talented fund raiser trying to convince those giving money to ARI that he and people he's hired to run the institute are actually doing something to spread Objectivism beyond giving away free books. The ARI seems focused on spreading Rand's philosophy mostly as how it applies (or how they think it applies) to the politics of the day. I don't think the Milgram bio will have much of an effect one way or the other. As people who knew Rand retire I think the details of Rand's life will become less important. And if you look it the reaction to the Burns and Heller bios, I didn't hear people say they were all a pack of lies. Objectivism strikes me as peculiar because it emphasizes attacking abstractions and dead people - for example, "altruism" and Immanuel Kant, who died in 1804. Doing this can make you sound edgy and radical, but in a phony way, because you don't run the risk of speaking truth to, and offending, powerful people who could retaliate. Also Rand just doesn't strike me as a learned person in general, and especially not well read in philosophy. Could she have given a competent lecture on a classic work of philosophy, like, say, Plato's Republic, which showed that she had read the text, she understood Plato's arguments and could explain them clearly, and also reveal that she had read and understood the standard scholarly literature about this dialogue to help in its interpretation? I just can't see her doing that, though her older contemporary Bertrand Russell could. It's interesting that the most negative things said about Rand come from Alan Blumenthal and his wife (the hectoring which caused them to break with her, among other things). It will be interesting to see how Milgram handles this. How will Milgram handle the Blumenthals? By not mentioning them, I expect. From 2004 to 2009, Robert Mayhew published four volumes of hagiographic essays on Rand's novels. Milgram has articles in all of them. In these articles, she often makes use of a series of interviews with Rand conducted by Barbara Branden. However, the interviews are footnoted as "Biographical Interviews: Ayn Rand Archives." Barbara Branden the unperson is never named. The far more delicate question is how Milgram will handle Rand's relationship with Nathaniel Branden. ARI may no longer care much about The Affair - but I suspect that Peikoff very definitely does. I could easily imagine him flying off half-cocked and pressuring the Ayn Rand Archives into denying her use of materials if he didn't like what she was writing about the Brandens. Remember the explusion of John McCaskey? If Milgram considers herself a serious academic, I don't think she'll want to mimic James Valliant's hit piece on the Brandens. But that may be what the O'ist Old Guard expects her to do. Which is why I continue to believe that she is waiting for Peikoff to die. . . This doesn't look like a careful researcher, although it's only one example. In 100 Voices, a collection of interviews with people who knew Rand, there are many references to her reading. Most of it was genre fiction: Agatha Christie, Donald Hamilton, Mickey Spillane. I have the impression that her knowledge base was a mile wide but about an inch deep. She picked up a lot by intensively questioning people who knew more on various subjects than she did: Isabel Paterson for American constitutional history, Peikoff for philosophy, Branden for psychology, Greenspan for economics. I don't think she actually did much serious reading. In the Ayn Rand letter, she wrote a critique of John Rawls' book A Theory of Justice without bothering to read it: she got her information from a New York Times review of the book. I really have some suspicion that the Ayn Rand archives are so careful about allowing access to her letters and journals because a close examination of the evidence would probably show how thin her reading actually was. Rand's misreadings are not confined to authors she was predisposed against: you can also find it in her interpretations of authors she likes. One of the more egregious examples: her constantly repeated claim that Aristotle regarded fiction as more philosophical than history because it represents things "as they might be and ought to be". I was always puzzled by this claim - because Aristotle never says any such thing. After all, Aristotle is writing about tragedy - and representing the actions of Oedipus or Medea as things that might be and ought to be is absurd on its face. The answer can be found in the Jennifer Burns biography. Rand got this misquote from Albert Jay Nock's book Memoirs of a Superfluous Man, where he writes: "History, Aristotle says, represents things only as they are, while fiction represents them as they might be and ought to be." As Burns notes, "In her copy of the book, Rand marked this passage with six vertical lines." In short, she is going by someone else's misreading of a philosopher instead of doing the reading herself. You can be pretty sure she did the same with Kant. If she couldn't be bothered to actually read Aristotle's Poetics, I can't see her working her way through the Critique of Pure Reason. "To go as far as to say [Rand] didn't read any of these guys [like Kant] ... you don't have the evidence for that. And you need evidence for it." The burden of proof falls first on Milgram to provide evidence that Rand did read Kant. The burden of proof does not fall on anyone to give "evidence" that she never did. It's much easier to come by evidence that Rand read Kant: find one copy of, say, Critique of Pure Reason among her belongings with margin notes in her hand. "Prove that Rand shouldn't be taken at her word," is what Milgram means. But we know Rand lied about a number of things. Since there are serious doubts about her having read Kant, the burden is on Milgram to show she did. I believe Rand had a degree in philosophy, so it's hard to imagine her never having been assigned Kant. She majored in history, not philosophy, from a Soviet university (Petrograd State University). Given how negative Rand tended to be about the books she would attempt to read (like Mann's "The Magic Mountain"), it's hard to imagine her slogging her way through any of Kant's critiques. But it hardly matters whether she did or not because, whether she read Kant or not, she clearly doesn't understand Kant; her criticisms of Kant are hyperbolic and fail to demonstrate that she has any clue what Kant is trying to achieve in his admittedly painfully abstruse and overly-pedantic philosophy. Rand wasn't a big reader, but I imagine she read some Kant. I recall Barbara Branden saying that she and Leonard would write summaries of philosophers. I bet the described them in the way that confirmed Rand's preconceptions.